Hezekiah Ball, the namesake of Ball Road. Like place names, the names of local streets, parks, and schools serve as reminders of our past – the people, places, and events that make up our local history. In fact, a number of early Orange County communities and school districts are best-remembered today in their surviving street names. I’ll go on adding to this list from time to time. If there’s other street names you’re curious about, drop me a line. BALL ROAD. Sometime before 1889, Hezekiah Wright Ball and several of his sons acquired about 210 acres southwest of Anaheim along Brookhurst, south of what would become Ball Road (a name in use as early as 1907). Ball was a true Western pioneer. Born in Kentucky, he grew up in Missouri and moved to Arizona in the 1860s where he and his sons ran freight teams across the desert. “He was born a frontiersman, and delighted in a wild and dangerous life,” his obituary in the Anaheim Gazette noted (Sept. 10, 1896). The freight business eventually brought him to California, where he settled down to the life of a farmer. Three sons, four daughters, and his second wife were all living in Orange County at the time of his death at age 72. The two CHAPMAN AVENUES. This one does throw some people. Chapman Avenue in Orange (and on to the west) was named for Alfred Beck Chapman (1829-1915), a Los Angeles attorney and real estate investor who founded Orange in 1871. Chapman Avenue in Fullerton was named for pioneer Valencia orange grower (and oil millionaire) Charles C. Chapman (1853-1944), the first mayor of Fullerton. To further confuse matters, Chapman University in Orange was named for the C.C. Chapman. The two Chapmans were not related. JAMBOREE ROAD. It’s surprising how many people don’t get this one. In 1953 the Boy Scouts of America held their third National Jamboree on 3,000 acres above Corona del Mar. The road built through the center of the campsite was naturally known as Jamboree Road. Today it has been extended all the way to Irvine Park. LAMPSON AVENUE. Here’s a name that’s gotten garbled. 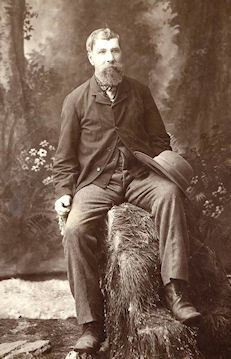 William B. Lamson (1810-1894) settled west of Garden Grove in the mid-1870s, where he was a successful farmer and a member of the Alamitos (not Los Alamitos) school board. But somehow, when the street name came into use in the 1920s his name gained an extra “p.” The mistake has persisted ever since. ORANGETHORPE AVENUE. The Orangethorpe School District was established northwest of Anaheim in 1873. Like the county and the city of Orange, the name played on the appeal of the word orange, combined with the Old English word thorpe, meaning a village. The community briefly incorporated as a city (1921-23), to block a proposed sewer farm in the area, but soon settled back into its rural existence. The school district was divided between Fullerton and Anaheim in 1954.